Smritiratna is an Order Member who has for some years now been a resident teacher at the FWBO’s Dhanakosa Retreat Centre in Scotland. Between retreats, he lives in the woods as a hermit, and has written FWBO News a ‘Letter from the Forest’. 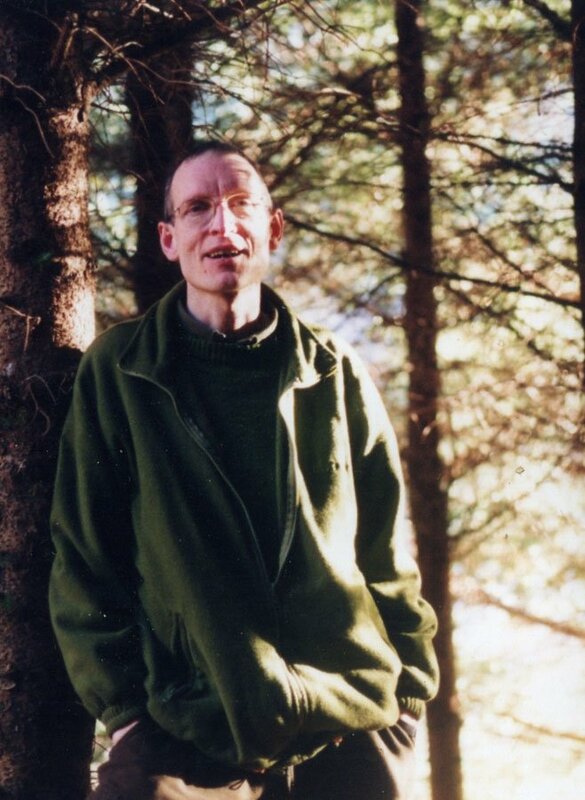 In it he describes his coming three-month retreat at Guhyaloka in Spain and his hopes for the ‘Stilling and Seeing Through’ insight retreats he will be leading on his return. If you would like to know more about these retreats, you could either read his long and detailed article (click here) or a shorter one by a retreatant (click here) or else try the websites of Dhanakosa or Vajraloka. “I am writing this at the window of the forest cabin where I spend much of my time these days, a mile from Dhanakosa Retreat Centre in Scotland. Looking up, a profusion of green leaves meets my gaze, thousands of grasses and ferns, spruces and larches, oaks and willows, birches and rowans, lichens and mosses. This rich variety arises in response to the rains that come so often here. Without the rains there would be only rock and sand as far as the eye could see. But the rains give life to the earth and green things flourish. “This puts me in mind of the first teaching of the Buddha, the one celebrated by Dharma Day at the full moon of the Indian month Asalha (June/July). I believe the torrential rains of the Indian monsoon commence around mid-June. So this first outpouring of the Dharma teaching of the Buddha was accompanied by ‘the soft thunder of the rain on leaves’. It came to be known as the Dhamma-cakka-ppavattana Sutta, (the ‘Dhamma-wheel-set-rolling’). The new Buddha has sought out the five ascetics who had shunned him before. Now deeply moved by his appearance and the quality of his presence among them, the five open their hearts once more and their teacher expounds the Four Noble Truths and Noble Eightfold Path. Transcendental Insight arises first in Kondanna. The Truth is out, the Dharma Wheel set rolling, and, eight-spoked like the Eightfold Path, it has rolled down the centuries, rolled through the lives of generations of the Buddha’s disciples and is rolling still. "Two years ago I spent the Autumn at Guhyaloka, Spain, on the Vihara retreat for Dharmacharis. We were in silence for ten weeks. As the basis of my daily practice, I chose this first Sutta of the Buddha, together with his second. Following the Eightfold Path as my system of practises, I cultivated vision and devotion, made efforts to maintain good moods, practised mindfulness and a range of meditations in accord with Bhante Sangharakshita’s system. Day and night I returned to the theme of impermanence, a pile of animal bones on my shrine, laid out like a skeleton at the feet of the Buddhas. Every day I sat before them in meditations – letting go the aggregates as best I could, and opening my heart to the Buddhas and All. "This system proved effective so the following year, when I introduced insight meditations on the ‘Stilling and Seeing Through’ retreats at Dhanakosa, they were framed within the Noble Eightfold Path. Practised as a spiral path, you wheel around it over and over. Each new glimpse of the Vision sends a new ripple through devotion, speech, action, livelihood, effort, mindfulness, meditation, stirring new insights into the Vision that in turn send a new wave though the eight spokes or limbs of the Dharma life. "By the time you read this I’ll be at Guhyaloka for another three month retreat. During the life of the Buddha, many of his disciples were forest renunciates for whom the annual Rains Retreat was regarded as an essential part of their practise. For nine months they’d wander from place to place, living the Dharma life in the open air, sharing the Dharma with the people. But for the three months of the monsoon rains, when the roads and paths were impassable, they would camp together in communities, dwelling in caves or temporary huts. These were the annual Rains Retreats. Inspired by their example, I plan to do a three month retreat every year from now on. This year at Guhyaloka seven Dharmacharis will attend for the whole three months while another nine will attend for one or two months. "I’ll return by December, in time to lead another Stilling and Seeing Through retreat, and then another at Vajraloka Retreat Centre, Wales. These retreats assume prior knowledge of the mindfulness of breathing and metta bhavana, also a basic understanding of the Dharma and of the Sevenfold Puja. For the first few days we’ll be settling and softening, in mindfulness and metta. Then we’ll contemplate the natural elements and spend a day on ‘transience and true refuge’ before returning to ‘visionary devotion’ at the end. If you would like to know more about these retreats, you could either read my long and detailed article (click here) or Joe’s short one (click here) or else try the websites of Dhanakosa or Vajraloka.